What do you do on a warm, clear, Saturday night in the South Bay? Well if you love photography, you might just want to learn to shoot the stars! This is just what twelve awesome and eager photo students did, joining Matt Granz and I (Jean) at the Aperture Academy gallery in Campbell. Capturing this other worldly dimension can be so much fun and so much easier than most people imagine. After everyone was signed in and seated in the gallery's classroom, we took a bit of time to introduce each other so Matt and I could get an idea of everyone's skill levels and what camera gear they had so we could better assist them on an individual level. Next, we moved on with our Powerpoint presentation using some very fine examples of star shots to give our students an idea of what they would be learning through the evening. From the various types of star photography and equipment used, to different exposure lengths either for pin point stars, or longer for streaking "star trails," as well as incorporating light painting and using available light for foregrounds. The hardest part of shooting at night is learning how to accurately focus and compose in order to achieve sharp images, but we discussed the many ways in how this could be done and how Matt and I would help them with this skill. Then it was time to gather in the ApCab van taking a short drive south of San Jose to the Almaden Valley where the night sky is a bit darker and more stars could be visible. At the top of our designated hill, we assisted our students in getting their gear set up and taking test shots to zero in on focus and find a composition they liked with their particular camera and lens combination. Once everyone was finished with this process, they were then able to begin getting the real goods for some lovely star shots on this incredibly clear evening. Students were instructed on taking 25-30 second exposures at a high ISO to achieve the pin point stars. Large oak trees bathed in ambient light from the surrounding neighborhood were used as our foreground, and we were excited to see the Milky Way was visible as the darkness overcame us. We also had some fun as I took a flashlight and wrote words to teach students yet another element to be easily incorporated into night photography. We then moved on to five, ten, and even fifteen minute exposures, changing ISO and apertures needed to capture the magic of star trails as the Earth spins through our universe. We also emphasized the importance of having a remote or shutter release chord to prevent camera vibrations over the longer exposures. Matt and I also helped in adjusting white balance to keep the blueness of the sky while maintaining warmth in the foreground and in a way which was pleasing to the individual photographer. With a few final 25 second exposures, Matt had some fun, and exercise, running through our student's foreground, light painting with a colorful cell phone app. The back screens of our group's cameras were showing a wonderful assortment of beautiful night sky images including shots with the Milky Way. 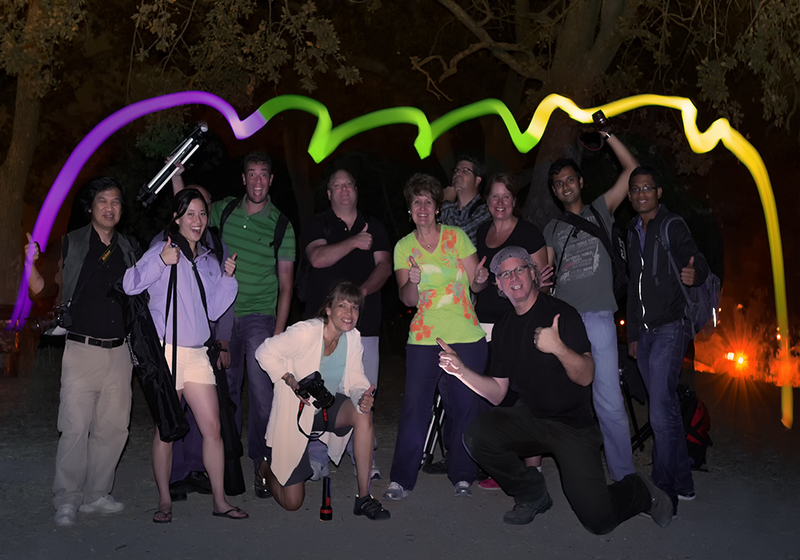 Our happy crew of urban astrophotographers posed for a final group shot memento before heading back to the gallery and home with the confidence of new skills learned to continue using and developing under the magical night sky.